My Aunt Otilia’s Spirits reminds me of the stories of spirits and ghosts told to us as children. These stories are common in Latino cultures; children have a fascination with ghosts and spirits and because of the oral tradition of telling ghost stories, some for teaching lessons, some for preventing bad behavior. As a teacher, I read this story around Halloween and el Día de los Muertos until the classroom library copy became too worn to use. One night, Demonio puts gum in his ear so he won’t hear Tía Otilia’s voice and he can stay awake. He hears a rattling noise and here are Aunt Otilla’s bones coming out of her body and flying out the window—but her body remains in the bed! When he jumps out of bed, he knocks the pieces of her body to the floor and she flies out the window. Rea’s idiomatic Spanish translation reads as well as the English, so the story will resonate for Spanish-speakers and English-speakers alike. For instance, “I really caught a spanking for chasing my Aunt Otila away” becomes “me dieron unas buenas nalgaras por asustar a mi tía Otila,” which is a more visual statement. Cherin’s and Reyes’ artwork is executed in acrylics and ink on a bright palette using lots of primary colors, and the bold handwritten text incorporated into the design adds to the book’s attractiveness. I especially love the picture of Aunt Otilia’s skeleton, carrying a handbag, flying out the window, while her suitcases have a spirit of their own; and I can just imagine Demonio’s anxiety as he tries to put his aunt back together after knocking her body parts off the bed. Kids break things, but not usually their relatives. 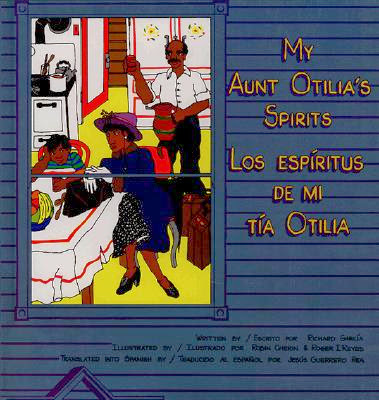 My Aunt Otilia’s Spirits / Los espíritus de mi tía Otilia provides the space to talk about children’s fears and nightmares, as well as ghost stories that children have heard in their families. For teachers, it’s an opportunity for class discussions about people’s beliefs about spirits in a positive way. It’s highly recommended.